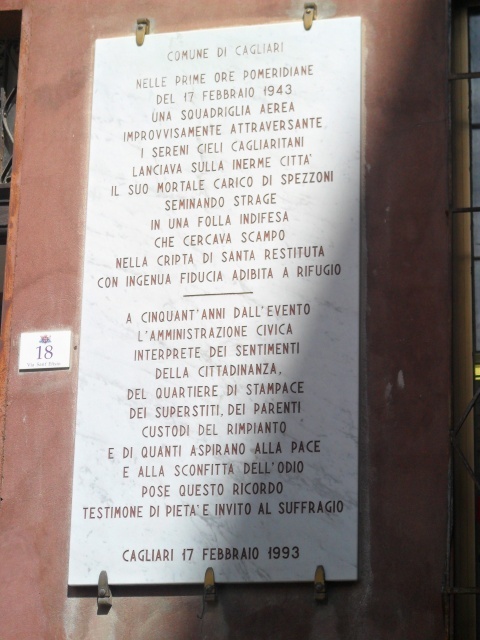 Plaque in honour of the victims of the air raid over Cagliari on february 17th, 1943. In 1943, Italy was still in war on the side of Nazi Germany. Sardinia and Cagliari became an important strategic objective for the Allied Air Force. For the serious material, and above all, human losses, on May 12th 1950 the President of the Italian Republic Luigi Einaudi gave to the city the gold medal for military valour. Even today, as we can see from the few period films, the scenery of death and devastation caused by the bombings, in places familiar and dear to us, seems unreal. On Wednesday 17th February 1943, Cagliari suffered the first dramatic raid. In the afternoon, American bombers flew over the city centre, dropping a large number of bombs. According to the official bulletin 100 people died , 255 others were injured. That day, there was a cruel massacre of unarmed fellow citizens, who had hoped to find a safe shelter in Sant'Efisio's street, between the churches of St. Anne and St. Restituta. IN THE EARLY AFTERNOON HOURS - ON FEBRUARY 17TH 1943 – AN AIR SQUADRON - SUDDENLY CROSSING – THE SAFE HEAVENS OF CAGLIARI – THREW ON THE DEFENSELESS CITY - ITS LOAD OF DEATH SPLINTERS- SOWING MASSACRE - IN A HELPLESS CROWD – WHO TRIED TO ESCAPE – TO THE CRYPT OF SANTA RESTITUTA - USED AS A SHELTER WITH A NAIVE TRUST - FIFTY YEARS AFTER THE EVENT – THE CIVIC ADMINISTRATION – INTERPRETING THE FEELINGS OF STAMPACE DISTRICT'S INHABITANTS – OF THE SURVIVORS – OF THE RELATIVES, GUARDIAN OF REGRET- AND OF THOSE WHO ASPIRE TO PEACE – AND HATRED DEFEAT- PLACED THIS MEMORY – AS A WITNESS OF COMPASSION – AND AN INVITATION TO SUFFRAGE.